i Click 'view all' to instantly compare this good deal with offers on other top automatic pet feeders. isYoung 5.5L Automatic Pet Feeder Electronic Control Feeder is currently selling at $84.45, approximately $0.01 higher than average. With a lowest price of $84.43 and an average of $84.44 it is selling on the high end of its usual range. Price volatility is 0.74% (meaning it does not change often), so the price should stay low for a while. Right now this product is a recommended 'good deal'. 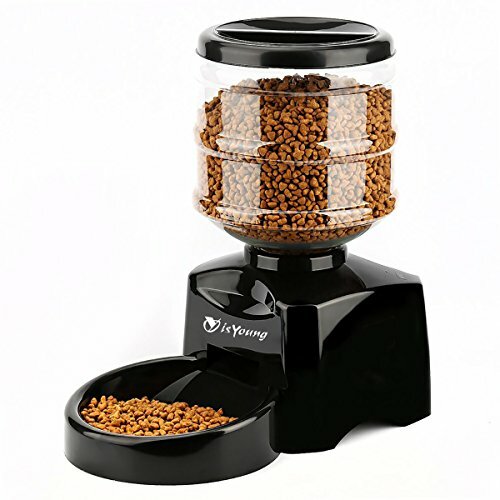 Compare the current price, savings (in dollars & percent) and Buy Ratings for the top Automatic Pet Feeders that are closely related to isYoung 5.5L Automatic Pet Feeder Electronic Control Feeder. Here is how isYoung 5.5L Automatic Pet Feeder Electronic Control Feeder compares with other leading Automatic Pet Feeders. 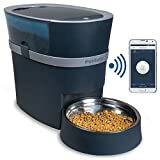 pet feeder Features5.5L Large Capacity - isYoung Pet Feeder provides you with a 5.5 liter funnel capacity so you can use it as a storage compartment to keep the food dry and fresh.Clear LCD Display - Clear LCD display with 5 buttons which can observe your pet's diet status. With a large LCD display, you can see the current time, meals programmed, meal size and meal served so you can notice the exact situation of your pet.Voice Record - Record your voice to remind your pets that it is time to eat. It can record voice messages about 10 seconds and play three times automatically. Mainly to let your pet eat on time.Easy to Clean/Handle - Environmental protection,resistance to impact and good heat resistance. Removable food tray, easy to clean. 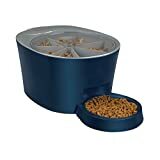 Handles any range of dry food size up to range 15m/m diameter.